Gregor Bieler from Xbox Germany takes to the stage to open the show. He then welcomes Phil Spencer to the stage. Phil talks about how Xbox, PC will look to bring gamers together with Xbox One and Windows 10 and talks about development of first party studios. Wiht Sea of Thieves, Recore, Gears heading up the 2016 lineup. Now it’s time for the games. With Quantum Break first game up. Sam Lake Remedy Creative Director on stage. The game will star Shawn Ashmore, Aidan Gillen, Dominic Monahan and will feature two elements, the game and live action show that will fuse together. More news on both this week at Gamescom. We then get a sneak peak trailer of the TV show. Release date is April 5th 2016. Let’s get hyped! Then comes Dave Jones to talk about Crackdown 3 and we get a behind the scenes look at ReAgent Games. There are a couple of glimpses of gameplay, showing vehicles and gun fights. Destructibility looks insane with apparently 100% destruction…. Next from Platinum Games is Hideki Kamiya to give a world premiere gameplay demo. I know there are a hell of a lot of people are interested in this game, but I’m not sure just yet. But I will be keeping an eye on it. Now it’s time to take a look at the console itself and what it will bring in the future with Mike Ybarra taking the stage. He announces that Freeview TV will soon feature DVR for live TV. You will be able to watch shows on the go. He shows a quick walk through on how to record a show. You’ll be able to stream shows to any Windows 10 device or download them to it. You can also schedule shows to record. Plus it will be a subscription free service, which is nice. He then announces the Xbox Chat pad. 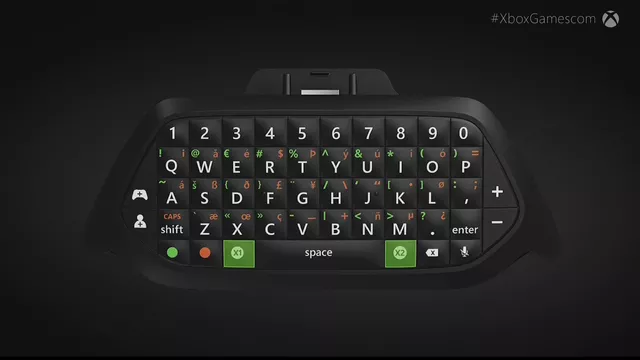 Featuring audio controls for headsets, and programmable keys – it will work with both Xbox One and Windows 10 and will be available November this year. He moves on to talk about Backwards compatibility and says there have been over 3 million votes for B/C games and announces that all future 360 Games with Gold games will be B/C and that B/C will be available for everyone November this year. Looks like November will be a big month for Xbox One as it will also Windows 10 coming to the console. Shannon Loftis the GM of Microsoft Studios takes to the stage to talk about Killer Instinct coming to Windows 10, and will feature cross platform play – I’m pretty sure we knew this anyway right? But she also announces that Killer Instinct Season 3 will release March 2016 on both XB1 W10. Plus Rash from Battletoads is available to download today. Winner! Time to move on to ID@Xbox and Chris Charla joins us. He says that there are currently more than 1000 studios creating games for ID@Xbox and that every game talked about today will be available on both Xbox One and Windows 10. He introduces Koji Igarashi to talk about Bloodstained. Bloodstained is a 2.5d side scrolling action rpg that will have cross platform play. We get a sneak peak at a new character too. He has no name yet, but hes a demon hunter who duel wields sword. Unfortunately there is no release date for the game just yet. Chris Charla then says that Cities Skylines and Train simulator will be coming to console first and that Team 17 working on new Worms game. Next sees focus on the Xbox game preview with the announcement that Sheltered will be available later today and that ARK: Survival Evolved, Rivals of Aether and Starbound are coming this winter. Plus from Compulsion Games – We Happy Few will also be hitting game preview this holiday and we got to see a trailer for it – it looks pretty crazy. I’m sure a lot of you already know, but we also get told that Windows 10 easily lets you record and share clips from PC games with built in game DVR. Plus anything you buy on one platform is available on the other. E.g. Fable Legneds. Jens Bergensten from Mojang talks a little about the Windows 10 version of Minecraft – it’s not really anything new other than the fact it’s available through Windows 10 and if you are an existing Minecraft player get the upgrade for free. He then announces a new game called Cobalt couch co-op adventure game which will be console exclusive and available this October . Next we see a Woirld Premiere trailer for Dark Souls 3 featuring a smattering of gameplay. The next game on the list is one that has been pretty quiet for a while Homefront Revolution. We get to see a trailer and then some gameplay for it too. I think it’s looking pretty good! Xbox One players will get early access to multiplayer beta this winter. It wouldnt be a games conference without some sports! Nick Channon from EA Sports comes on to talk FIFA 16. Xbox One players will get access to exclusive FUT Legends, 10% Discount on FUT Coins and you’ll be able to play the game around a week early through EA Access. Phil Spencer comes back on stage to reveal two Xbox One Fifa 16 bundles a .500gb and a 1tb version. We then get some weird E-sports stuff, it’s not my bag, but we get a match up between Epsilon Esports and Optic gaming on the new Coliseum map. The gameplay looks great – I just try and block out the e-sport stuff. 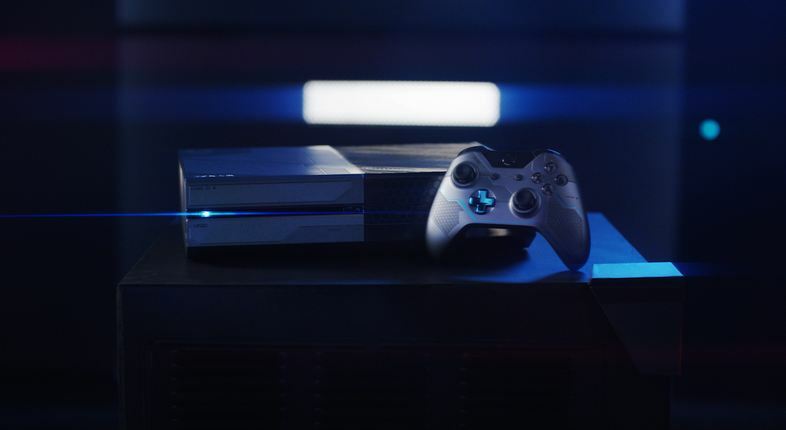 There will also be a Halo themed 1TB console available for pre-order now. Josh Holmes comes to the stage to announce the Halo World Championships that has a whopping prize pool over $1 million. Plus Arena and Warzone are both playable at Gamescom this year! A little Just Cause 3 now. Now its time for Turn 10 and Dan Greenawalt to talk about Forza Motorsport 6 which releases 15th September. THe game will have over 450 vista cars – all with working cockpits amongst other features. It will also have 26 world famous destinations and have 24 player races on dedicated servers that will use ranked leagues for fairer races. There is then a short World Premier trailer of Rainbow 6: Siege. Nearing the end now we have Brian Horton from Crystal Dynamics who brings exclusive new gameplay from Rise of the Tomb Raider. We now have Phil Spencer back to close the show, but not before one final announcment, he introduces Bonnie Ross from 343 who announces that Halo Wars 2 will be coming to Xbox One and Windows 10 fall 2016. Mine bombshell! But still awesome! There you have it. I think I got pretty much everything covered, but I might have missed the odd thing if I did I’m sorry, but there was a lot going on. How did you think the show went? Were you happy with what you saw?